On June 13th, it was announced that KAT-TUN Kamenashi Kazuya's drama 'Yokai Ningen Bem' (aired in October 2011) will be adapted into a film. The drama caused quite a stir since the popular animation that the drama was adapted from received an average viewer rating of 15.6% (highest viewer rating 18.9%). This popular animation had aired in 1968, and the drama adaption created an original modern version of the story, which became popular among teens and children who did not know about the original animation. The drama tells a story of three humanoid monsters Bem(Kamenashi), Bera(Anne), Bero(Suzuki Fuku) who want to become human beings, but they are persecuted by the human race because of their hideous looks. For the movie adaption, Nishida Masafumi will be in charge of script and�Kariyama Shunsuke will be directing, much like the drama. Kamenashi stated "I am also really wondering where and how they (Bem, Bera and Bero) are doing now, so I'm looking forward it." Anne, who is also looking forward the movie adaption, commented "I want to play a more powerful role as Bera," while Suzuki Fuku added, "I like action, so I hope there are action scenes in the movie." 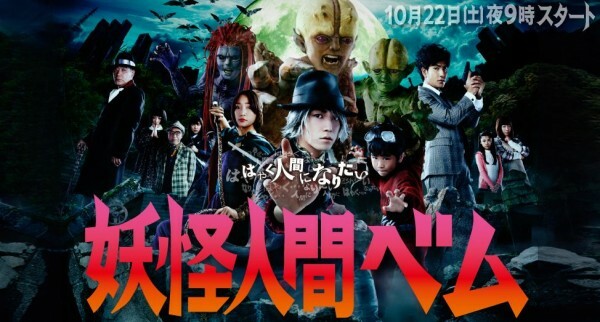 The movie adaption of 'Yokai Ningen Bem' is scheduled to release nationwide on December 15th.